I read this article and found it very interesting, thought it might be something for you. The article is called How 52 Million May Depend On Rural Jobs Plan For 20 Years and is located at https://archive.indiaspend.com/cover-story/how-52-million-may-depend-on-rural-jobs-plan-for-20-years-90589. With a 14% rise in funding for the Mahatma Gandhi National Rural Employment Guarantee Act (MNREGA) in Budget 2016-17, the world’s largest state-run jobs plan continues to be India’s top poverty alleviation programme, after a decade of operation. MNREGA, which guarantees 100 days of work to unskilled labourers in villages of India, will employ at least 52 million people and provide livelihoods to their families. That means about 260 million (considering an average family of five) will depend on it over the next 20 years, according to an IndiaSpend analysis. The table above shows that NREGA funding has risen 18% over three years. Unlike last year, though, when the programme exhausted its money by December, it is unclear what might happen this year when–which is more likely than if–money runs out. In 2015-16, there was a buffer of Rs 5,000 crore in case the ministry finished its money, but Delhi released only Rs 2,000 crore of that money, according to Aruna Nikhil Roy of the People’s Action for Employment Guarantee, a Delhi-based NGO. The absolute number of poor as well as the proportion of poor below the poverty line (according to the Tendulkar poverty line) has been declining over two decades, as we reported. But about 270 million are still below the poverty line, more than the population of Indonesia (255 million), the world’s fifth-most populated country. The poverty line is the ability to spend Rs 47 per day per person in urban areas and Rs 32 in rural areas. MGNREGA is being lauded for its achievements in the past decade. There are 277.9 million registered workers under the scheme, and 98.3 million of them are active workers. The programme covers all adults from rural households who seek employment. The “work” under MGNREGA covers “unskilled manual labour”, providing an opportunity to every person who needs employment. To calculate how many Indians will need employment in the coming years, IndiaSpend looked at the illiterate rural population, according to the 2011 census. There are 51.7 million illiterate people aged 16 to 30. Since they will not benefit from the Right to Education, which guarantees free and compulsory elementary education till age 14, this population will not be a part of India’s skilled labour force. “Skills”, according to this International Labour Organisation definition, require at least five years of schooling. So, for at least 20 years, MGNREGA will likely need to support this group of Indians. A word of caution: This 52 million (rounded off) population includes only illiterates from the Census 2011 data. There are many among the literate population who have basic reading and writing skills but are not skilled enough to work in industry. 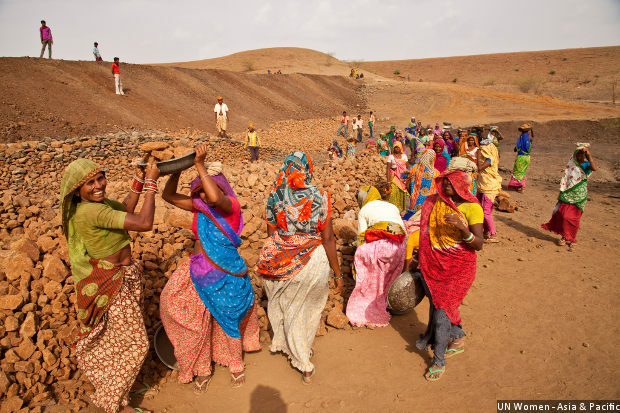 MGNREGA critics contend that the scheme does not help pare poverty because of corruption and poor implementation. “From a policy point of view, we should be interested in the efficiency of transferring incomes to the poor,” Surjit Bhalla wrote in the Indian Express recently. With no cost-benefit assessment of MGNREGA work and no technical support, the programme struggles to create assets or infrastructure in rural areas, which it should, Indian Institute of Technology (Delhi) economics professor Reetika Khera, wrote in a recent Indian Express column. MNREGA is short of funds; 17% of its budget went into paying wages and materials from the previous financial year, according to a letter from Ministry of Rural Development to the Ministry of Finance. The actual allocation for MNREGA this year is around Rs 29,000 crore ($4.6 billion). This fund squeeze for MNREGA is not new and has been evident under both the United Progressive Alliance II and the National Democratic Alliance regimes. Ending the year with pending liabilities, which effectively means workers’ wages are unpaid, has been a consistent trend. As much as 95% of the budgetary allocation for the current financial year (2015-16) was exhausted by December 30, 2015. Further, as per the Ministry of Rural Development and Ministry of Finance calculations, state governments require at least an additional Rs. 6,300 crore to pay wages and other expenses. The drought-affected states of Odisha, Madhya Pradesh, Karnataka, Andhra Pradesh, Telangana and Uttar Pradesh will provide 150 days of employment–against the normal 100–but there is no extra money evident, from Delhi or in their budgets. Under the devolution recommendations of the 14th Finance Commission, India’s states have been given more money, and hence more powers, to decide how they want to finance social welfare. The Planning Commission had 66 centrally sponsored schemes, reduced to 30 under the NITI Aayog, the body that has replaced the Planning Commission. MNREGA is one of these 30. Even though the Centre has transferred social welfare to the states through “devolution” (transfer of powers–fiscal or administrative–from higher level of government to lower level of government), it will pay for important programmes, such as NREGA and rural roads. A point about the “illiterate” population. In our experience in Himachal Pradesh, one of the most ‘literate’ states in India, it is not just being literate (whatever that means), but being functionally literate i.e. able to understand what one reads or writes and have a basic understanding of numeracy that is CRUCIAL for any subsequent skill acquisition. We learnt that many (most?) village women who were ‘literate'(Class V pass) were unable to hold a pen or pencil properly and could barely write. The reason for this, it turned out was that the gap between these women leaving school and the time when we took to training them, was so long, often 10 years or more, that these women had ‘forgotten’ how to write and read. We called this relapse into illiteracy. So, your 52 million could easily be 104 or 156 million! By making payments directly to workers’ bank accounts, the Modi government removed the biggest drawback–corruption–in MNREGA.